Feature phones are making a comeback! The Nokia 105 is a funny proposition for the European market as people won't be buying it as their main device and possibly not even as their second handset. It's capable of taking some knocks and the battery lasts a month, but it feels awfully old-fashioned. A glance up at the picture above and with the word "Lumia" missing from this device's name you may think we've travelled back in time, but oh no the Nokia 105 is very much part of the here and now. While smartphones having been ruling in the roost in places such as Europe and the States, feature phones still play massive part in the mobile phone ecosystem in developing countries where demand for low cost, basic handsets is high. The 105 takes over from the Nokia 1280 as the entry point into Nokia's mobile world, and it's got some pretty big boots to fill as the 1280 managed to shift 100 million units in three years. There is a twist though. Nokia isn't just targeting the emerging markets this time round, it plans to bring the 105 to Europe as a companion phone which can offer rugged, cheap functionality and standout battery life. When we say cheap, we mean it as the Nokia 105 will set you back €15 (which is around £13) and will be available in some European countries by the end of March, although it hasn't been confirmed for the UK just yet. Unsurprisingly the Nokia 105 is completely plastic and its chunky frame reinforces the fact that this handset is incredibly basic in the functionality department. It's very light meaning that its bulbous shape isn't taxing on the wrist and the dust- and splash-proof keypad is a handy touch, especially if you're considering the 105 as a festival phone. While colour displays are nothing new, the 105 is Nokia's first entry-level feature phone to sport one, although we'll warn you now it's about the size of a postage stamp at 1.45-inches. The Nokia 105 may not carry the Lumia name, but there are hints of the smartphone range's design when you inspect its body with rounded corners and simplistic finish. Available in black and the rather more psychedelic cyan - which has become synonymous in the Lumia range - Nokia hopes the brightly coloured 105 will stand out among the sea of black slabs currently on the market. In terms of features there's not much to write home about, with the Nokia 105 sporting early 2000 classics such as FM radio, built in flashlight and a talking clock. There's no camera, app store or social network integration, but what you do get is a phone which will make calls, handle text messages and even boasts a headphone jack if you fancy listening to some tunes. Operation is a little on the slow side as the weedy feature phone processor takes several seconds to work through some tasks - you won't be winning any speed tests here. An 800mAh battery may not sound particularly special, but Nokia reckons it will provide you with up to 35 days standby, and it should easily see you through a two week period of relatively intensive usage without needing a top up. The Nokia 105 is a funny proposition for the European market as people won't be buying it as their main device and possibly not even as their second handset. It's very much a back up, emergency phone which is capable of taking some knocks and deliver a battery life which can last you a month, but it won't be able to offer the experience we've come to expect from our mobile phones today. 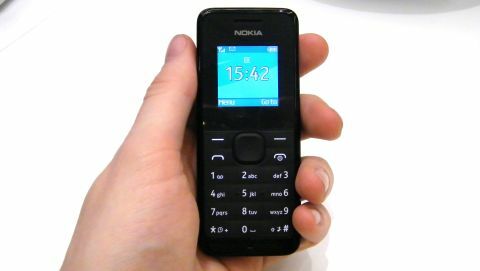 A feature phone still makes a lot of sense in the developing world, but in markets such as Europe expectations are very different and the Nokia 105 seems destined to spend the majority of its life in the kitchen draw.